In the New Evangelization, we talk about “meeting people where they are.” Increasingly, mobile devices are where people are. We have so much information in our hands. So how can we ensure that faith is at your fingertips? With the app, you can stay up to date with events and messages from your parish. You’ll also have easy access to daily readings, reflections, prayers and more enriching content to help you live Catholic life every day. You can schedule daily or weekly notifications to pray or schedule a reminder to go to confession. There’s even an interactive examination of conscience built right into the app! Do you want to stay in touch with multiple parishes? You can “Favorite” each one and receive messages from each. This is a great feature for retirees or families that frequent each other’s parish communities. Has your phone ever started ringing during Mass? Turn on “MassMode” and you’ll get a notification 20 minutes before Mass to silence your phone. Problem solved! Exclusive to the Diocese of Sacramento are buttons to read Catholic Herald magazine, listen to “The Bishop’s Hour” weekday podcast, and watch “The Sacramento Bishop’s Corner” monthly interview series. We hope that this free resource will help you strengthen your practice of our beautiful Catholic faith, and that this tool will help parishes foster a stronger relationship with you. To download the myParish App to your Apple or Android device, text the word “App” to 88202 or search for myParish App in your app store. Then search for your parish within the app. That’s it! Be sure to also search for and “Favorite” the Diocese of Sacramento to stay in touch with us. For more information, email bvisitacion@scd.org. 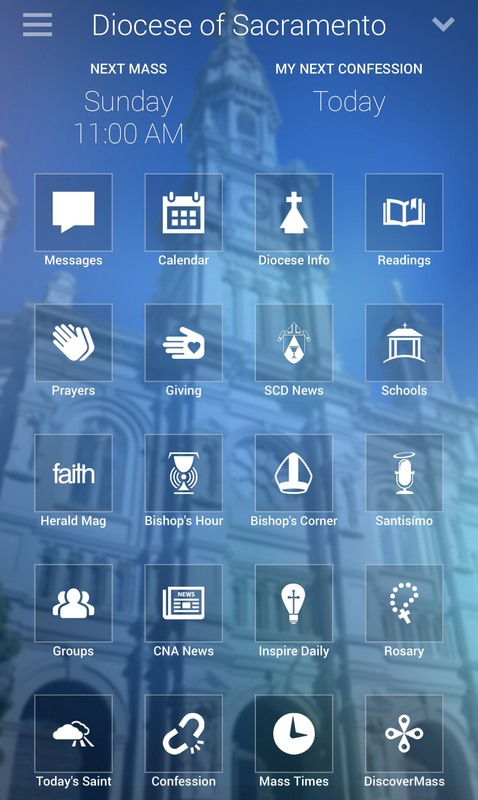 Do you want the myParish App in your parish? Contact BeeJae Visitacion to find out how.